To create a unique and exciting interactive experience at the Woodside Energy Perth CBD office, as well as a strong Brand Identity for the activation to celebrate Woodside’s 60 years of success. Lux installed an impressive video display wall in the foyer, standing at an impressive 8m x 3m, which provided the foundation for the concept of a “living mural”. Interactivity with the mural was both passive, moving while people were viewing in the foyer, as well as active, where people could stand in front of the wall and engage directly with it, moving in and out of “zones” to trigger engaging interactive content. 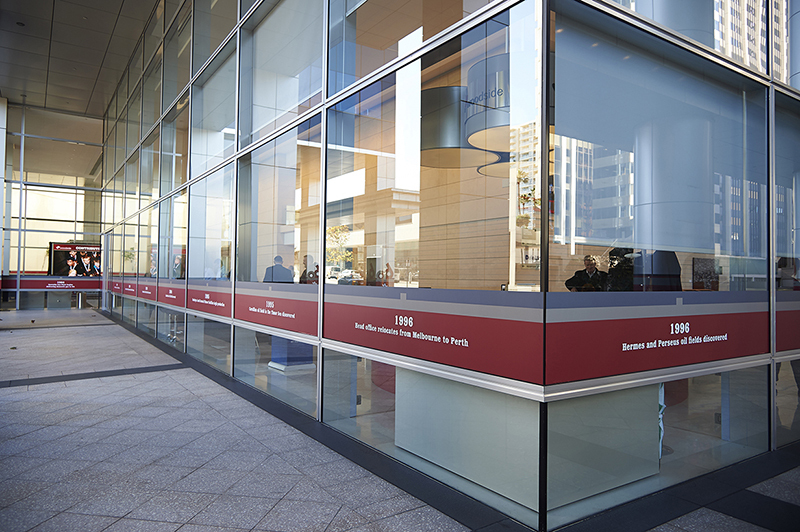 Woodside’s brand identify was used to create enormous decals that were applied to architectural features of the head office building. 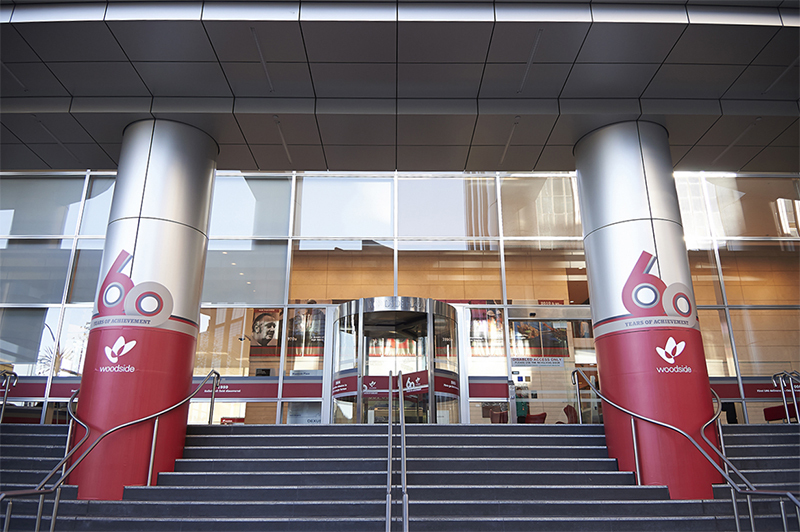 The visual effect of the 60 Year branding on the external and internal areas of the Woodside building were hard to miss for passers-by which portrayed key messages successfully and with high impact. 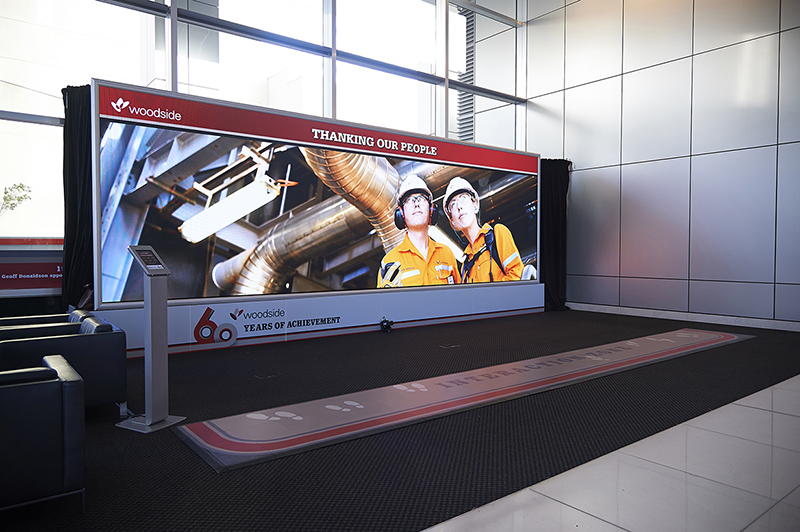 The interactive screen, along with creative multimedia content, encouraged passers-by to stop and “have a go” at the fun activation, which presented Woodside’s key milestones over their impressive 60 year lifespan. All key messaging was executed seamlessly and clearly, taking employees and guests of Woodside on a journey down memory lane and relive 60 Years of achievement with Woodside.